The withdrawl of the state has lead to a surge in vigilante violence. 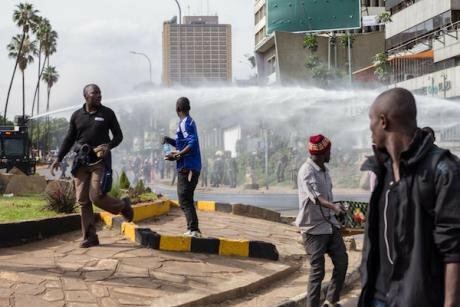 Nairobi police use water cannon on a crowd during post-election unrest in 2017. Image: Jan Husar/Zuma Press/PA ImagesKenya is increasingly under pressure on three fronts. To begin with, the country has been plagued by repeated cycles of election-related violence. Even though last year’s elections were settled in the courts rather than in the streets, they highlighted deep ethnic divisions most keenly felt in poor urban settlements. Secondly, numerous non-state armed groups have taken over providing security in areas where the state is practically absent. These groups often combine the characteristics of criminal gangs, political militias and vigilantes. Their members, mostly young men from poor neighbourhoods, provide protection from rival armed groups and crime control for their community. Finally, drug-trafficking organisations are gaining ground along the Kenyan coast, which is a major transit hub for narcotics. Heroin has been consumed by wealthy inhabitants and tourists in Mombasa for over 30 years. But the more recent expansion of the drug trade has led to an escalation of violence between rival traffickers, the police, and vigilantes hired by drug lords. The 1990s was a bad decade for Nairobi when the city gained notoriety as one of the most violent cities in Africa, earning itself the nickname Nairoberry. Poverty and inequality was on the rise and the criminal justice system started to fall apart. In addition, the circulation of small arms became more widespread. This led to a wave of criminal violence that spread across the country. Even though Kenyans from all walks of life became victims, poor slum-dwellers suffered the most. On top of criminal violence, Kenya has also been plagued by episodes of election violence. In the worst in 2007 and 2008, police employed indiscriminate violence against poor people in cities in an effort to contain violence to informal settlements. The rise in violence had a threefold effect: criminal violence intensified the separation between well-off and poor neighbourhoods. It also contributed to the segregation of slums into distinct ethnic villages, exacerbating ethnic clashes and reinforcing an ethnic dimension to Kenyan society that goes back to colonial times. In these impoverished slums, soaring crime rates triggered the emergence of spontaneous mob justice and more organised vigilante groups. Kenya’s police have become absent and illegitimate because of a flawed colonial policing model as well as the politicisation of the police force and the wilful hollowing out of state institutions in the post-colonial period. The security void left by the withdrawal of the police has been filled by two types of non-state security providers. In the most affluent parts of the main cities residents are paying for private security firms. In poor neighbourhoods residents have resorted to vigilante groups for their own safety. Vigilantes patrolling slums in and around Kenya’s cities are often seen as a legitimate response to problems of security and lack of access to institutions of justice. I found during fieldwork that certain vigilantes have not simply taken over the state’s role as security provider, but even the provision of water, electricity and lightning. I also found a complicated love-hate relationship between vigilantes and the community. While they protect neighbourhoods they are also seen as protection rackets given that they extort money from residents and businesses in the areas in which they operate. In Nairobi, many of the groups started as vigilantes to protect their neighbourhood but turned into gangs preying on their community and extorting passengers and drivers of commuter transport. When confronted about their criminal activities, they have been known to eliminate community leaders to defend their control over the area. Many have thereby crossed a line that delegitimised them in the eyes of inhabitants. Further complicating the picture is the fact that vigilantes are regularly employed by politicians. For example, in the late 1990s Nairobi politicians from both the ruling and opposition parties started to rely on vigilante groups for their security and to attack rivals. The effect of this trend was felt acutely 10 years later in the 2007 elections when Nairobi witnessed terrible violence in numerous slums as the two main contestants deployed ethnic vigilantes in the struggle for power. These clashes led to slums becoming increasingly segregated into ethnic villages. It also split the legitimacy of vigilantes along ethnic lines – while they increasingly enjoyed legitimacy among particular ethnic groups in their territory, they were hated in equal measure by others. This set the stage for recurrent patterns of ethnic clashes and retributive attacks between vigilantes. For the police to avoid the same pitfalls that plague vigilantes, they must be held accountable for any violation of the rule of law. Apart from political violence, vigilantes are also regularly involved in organised crime. This practice is more widespread along the Kenyan coast, where the port city of Mombasa, Kenya’s second largest, has emerged as an important transit hub for transnational drug traffickers. In the end, vigilantes suffered the same fate as the absent and illegitimate police force they claimed to replace: they became corrupted and politicised. They became part of the problem rather than part of the solution. This has further delegitimised the Kenyan state, which struggles to deal with vigilantes gone rogue. As fieldwork I did in Haiti confirmed, vigilantes have a tendency to go bad and regularly turn out to prey on the very community they claim to protect. Given the lack of resources and oversight or accountability mechanisms, such a transformation is extremely difficult to avoid. The only way to address the challenge posed by vigilantes is to replace them with functioning state security forces. For the police to avoid the same pitfalls that plague vigilantes, they must not only be properly trained, equipped, and paid, but above all must be held accountable for any violation of the rule of law. Reforming the formal security sector requires long-term investments and strong political will. Still, it is a more realistic and pragmatic way to deal with security problems than relying on informal security providers. As this article has shown, vigilantes further undermine the capacity and legitimacy of the state – the very reason they emerged in the first place.